Shakib al Hasan has played six Tests before this current one against New Zealand, but he hasn’t hit a fifty and before today he was averaging over a hundred with the ball. Not any more. After Bangladesh recovered from a rocky start to their innings to post a mediocre 245, Shakib set about the New Zealand batting to the tune of 6-31. Bangladesh need a Test win or two. Near-misses just get chalked up as innings defeats in the minds of cricket’s incognoscenti. Shakib’s hit a fifty as well, now, 2nd dig. Is the correct word incognascenti or uncognascenti? I am an incognascento/uncognascento spellingwise. 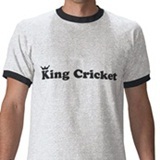 Kingcricket, ages ago when you picked him as a one to watch you said that when he finally came good we could all say that we had been watching him for years. Well, I did that today. Is it right that Jos Buttler won a Test spot without playing first-class cricket?